A lemur sits in a tree in Antananarivo on July 21, 2014 in Antananarivo, Madagascar. A new study shows that lemur social networks function much the same way that human ones do: the more successful a lemur is at completing a task (getting food out of a box), the more popular that lemur becomes. 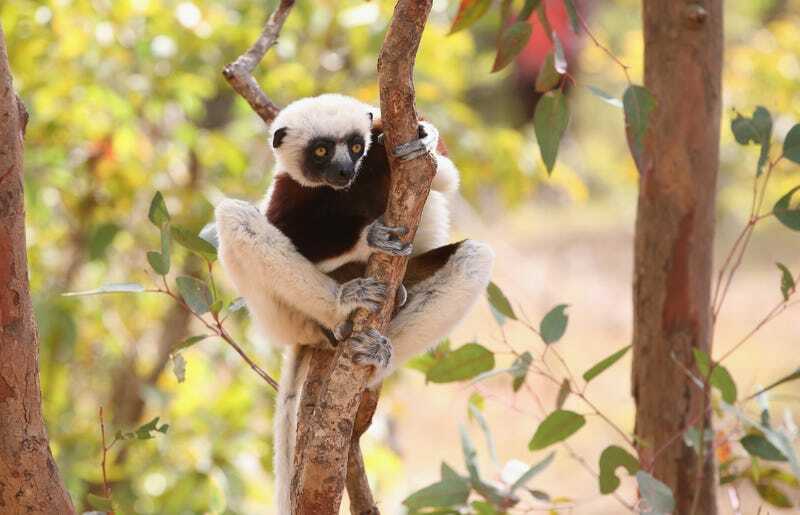 The study also found that the reverse is true: lemurs who had more friends to begin with were more likely to solve a complex task, implying that social connections influence an animals’ intelligence. It’s sort of like those age-old adages that your grandma spams your email with (the ones that start with “Choose your friends wisely,” or “A man is known by the company he keeps”), except that this is about lemurs, not humans. These rules explaining the interplay of social hierarchy and intelligence actually make a ton of evolutionary sense: to be successful, animals have to learn from and about their environment, and then apply this knowledge to things like finding food and avoiding predators. It seems fitting that the smarter an animal is, the more friends it has, and the more friends an animal has, the smarter it is. Still, this is the first time researchers have looked for this connection in the animal world. The study, published in Current Biology, involved a food reward task in which lemurs learned to retrieve a grape by opening a drawer in a Plexiglas box. The authors found that social interaction and cognitive abilities were “feedback” loops, meaning that intelligence influenced a lemur’s social network, and the size of the network in turn influenced learning.